Hello everyone! Happy Monday! 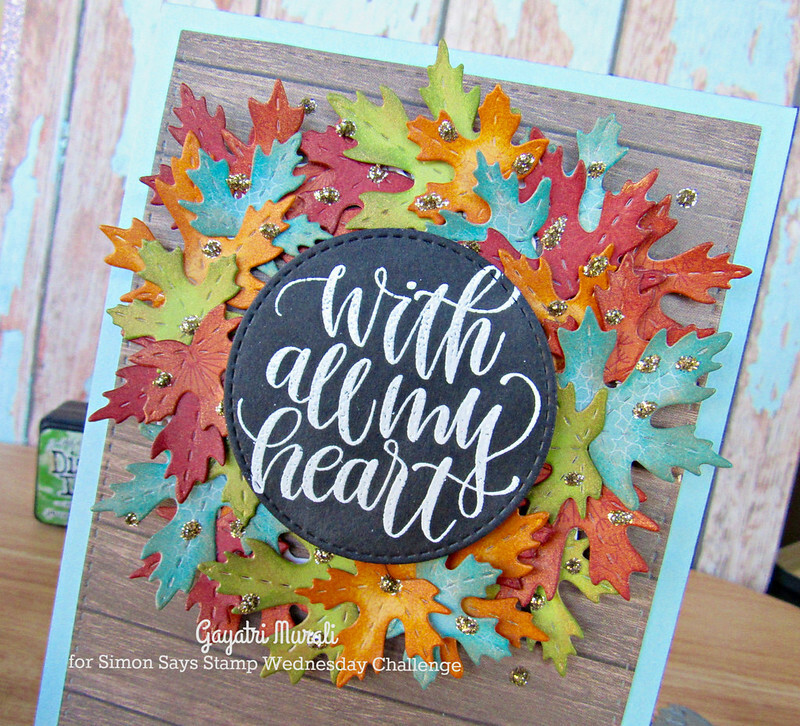 I am sharing a card using the Simon Says Stamp November card kit. This kit is out of stock but all the items in the kit are available for purchase separately from Simon Says Stamp Store. This card kit came only end of last week to me. So I made couple of cards over the weekend. Here is one of them. 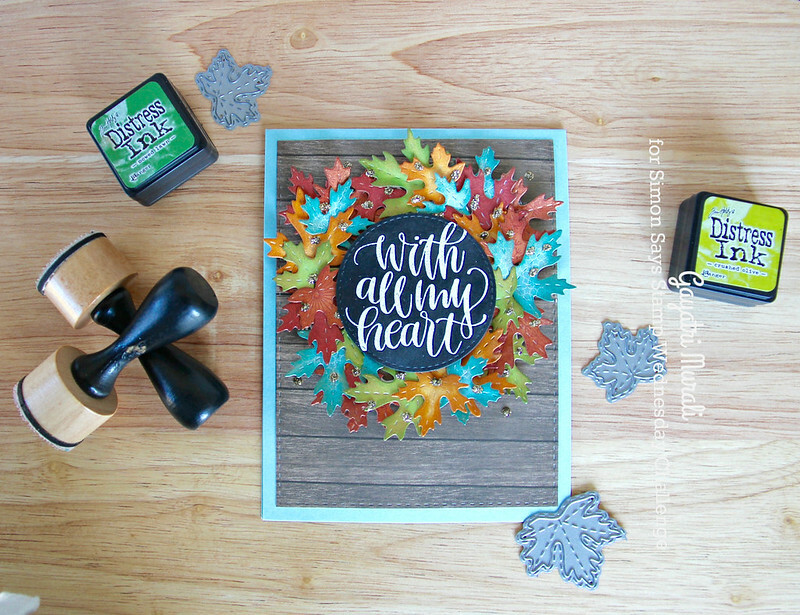 I used the pattern paper from the card kit and the Stitched Leaves Trio die set from Simon Says Stamp to die cut a few leaves. I sponged the edges of the leaves with a darker colour distress ink to the die cut leaf colour to add depth. Then I also sponged the copper ink from the card kit to add some shimmer. The base of the card is made using the blue cardstock from the kit. 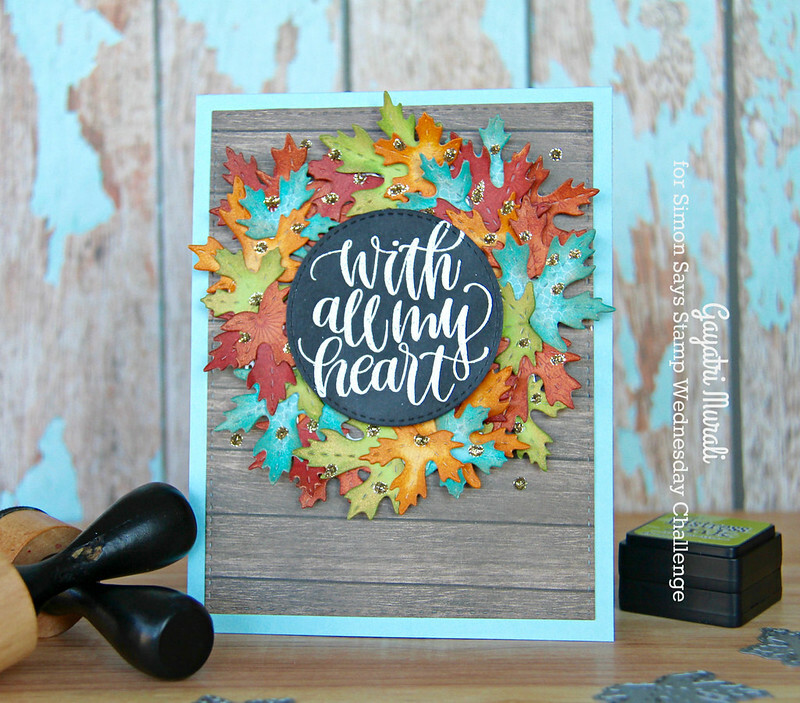 The wooden plank pattern paper also from card kit is die cut using the largest stitched rectangle die from Stitched Rectangle die set from Simon Says Stamp. I adhered the leaves in a circular pattern like a wreath. I added a tad glue at the centre of the back of the leaves so the edges are raised. The sentiment from the stamp set in the card kit is white heat embossed on black card stock, die cut using a stitched circle die. I adhered this sentiment circle using foam adhesive on the centre of the wreath. Then I added drops of gold stickles that came in the kit. Hope you like my card. I love the stamp set in the kit. Such a gorgeous bold font and sentiment. My next card showcasing the sentiment. I will share it later this week. Gorgeousness!! Love the colors & those awesome stitched leaves!